Fanjingshan is an isolated mountain landscape with a high degree of endemism. It is a rugged terrain of primary forest. It includes endangered floral and fauna species, such as the Guizhou snub-nosed monkey. Due to Fanjingshan’s wet climatological circumstances it also shows an extraordinary richness in bryophytes (mosses). 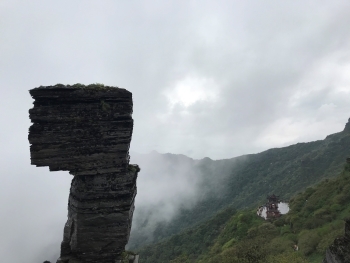 Fanjingshan (literally Clean Brahma) is a gem of mountaineering not yet known to many global tourists. The nearby town of Tongren has a new airport which has a shuttle directly to the ticketing hall on the mountain. The connections to this airport are quite plentiful (Beijing, Guangzhou, Chongqing, Shanghai and Guizhou)From the same airport people go to visit Fenghuang (Phoenix) Ancient Town for another national relic, with at least one shuttle going there in the afternoon. You can also easily find accommodation around the Fanjing town or at the communities (towns?) around the ticketing hall area. There is a cheap shuttle bus from the town to the mountain area during the day time else you have to rely on a black taxi. From the entrance there is a cable car station that will take you to almost the top of the mountain. It is actually worth doing because on the way you do not get to see much on the hiking path. I saw it below the cable car and was happy with my decision unlike on other mountains I have visited. Here the path looked boring. The best part of the scenery starts after the top cable car station drops you off. 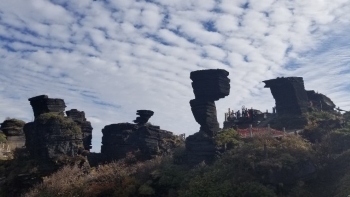 A few miles up the mountain and you will be awed by rock formations. These plates make up stacks worth of multiple photoshoots. The main path goes along several of these and up to a temple which you can skip if not your cup of tea, then you can go along the mountain range to the rest area with shops and food stalls. Here is also the beginning of a steep 70 degree staircase to another temple/shrine on a high rock - which will immediately remind you off the Monastery of the Holy Trinity in Meteora (aka the James Bond monastery from For Your Eyes Only). I did not actually go up on this one having been to the other temple peak already. It is impossible to miss from anywhere on the mountain and the best shots were from across the other temple. Overall this is a simple day trip. I didn't see any foreign tourists here although it was slightly off season already, but there are plenty of domestic tourists all over and the main rock formation photo spot was totally covered with people at around 10 AM. Seeing that this was November I would bet the warmer months are very crowded. One of the unique aspects of the area is the endangered Guizhou golden monkey. You will not come across any on the paths you take in the park. There are some info boards on the hike up and down that mention the habitat and behavior so you kind of get a feeling they are around - but naturally we should be glad they are in protected areas away from the crowds.